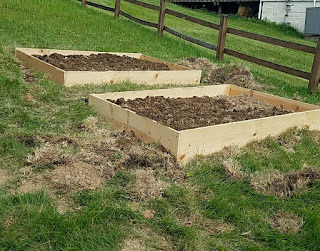 Regular readers will remember that, the summer after I bought my house, I decided to plant a vegetable garden. You may recall, vaguely, somewhere in the back of your mind, that I wrote a post about digging a garden patch by hand and communing with my starving Irish ancestors, following which I never blogged about my garden again, unless you count that one time a year later when I complained bitterly about weeding the rockery and mowing the lawn. That’s because I didn’t end up growing any vegetables. A lot of stuff didn’t come up. Some stuff came up and the rabbits immediately ate it. Other stuff came up and seemed to be doing very well, until it died. Later, I would discover that I have voles. So, this summer, I pulled out all the stops. 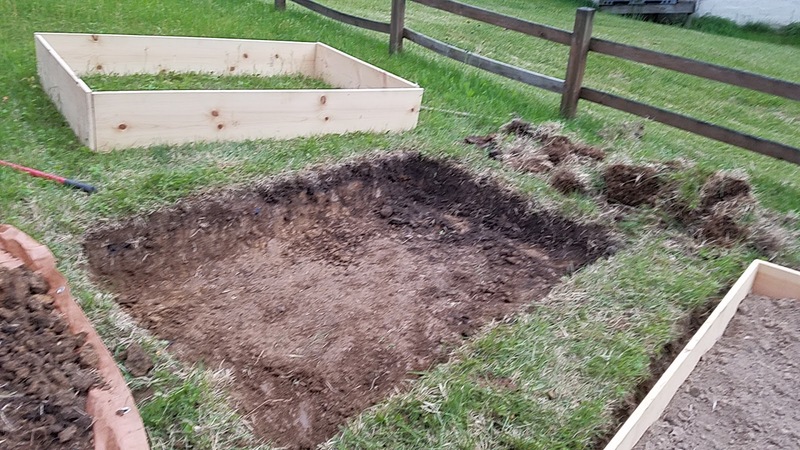 I decided that I was going to grow some vegetables, dammit, or else. My grandparents made it look easy – throw some seeds in the ground, nail a dead animal to a post1, and voilà, delicious produce. 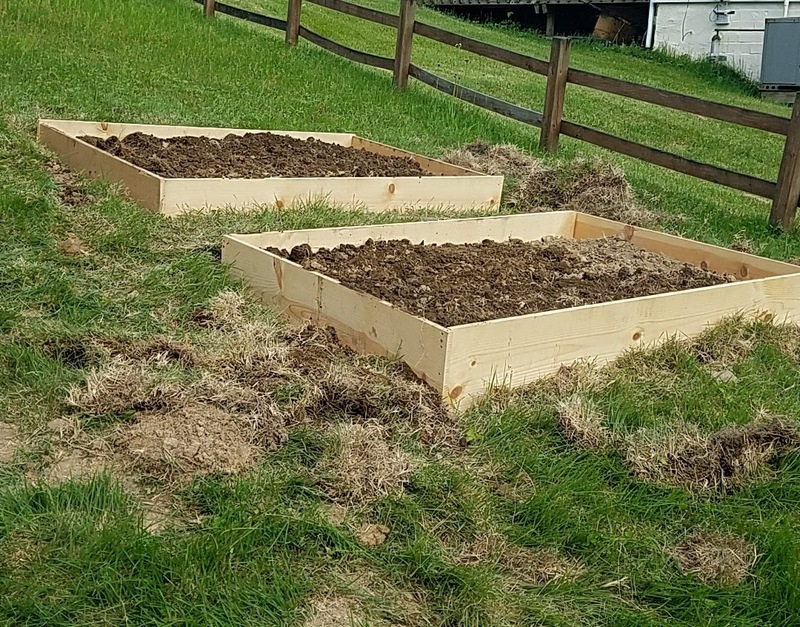 This year, I thought I’d move the vegetable garden to a different, sunnier part of the yard, with better soil. I also thought I’d install raised beds. Raised beds allowed me to practice the only reliable form of vole prevention I was able to find in my online research, which is to line the plot with a sheet of wire mesh. 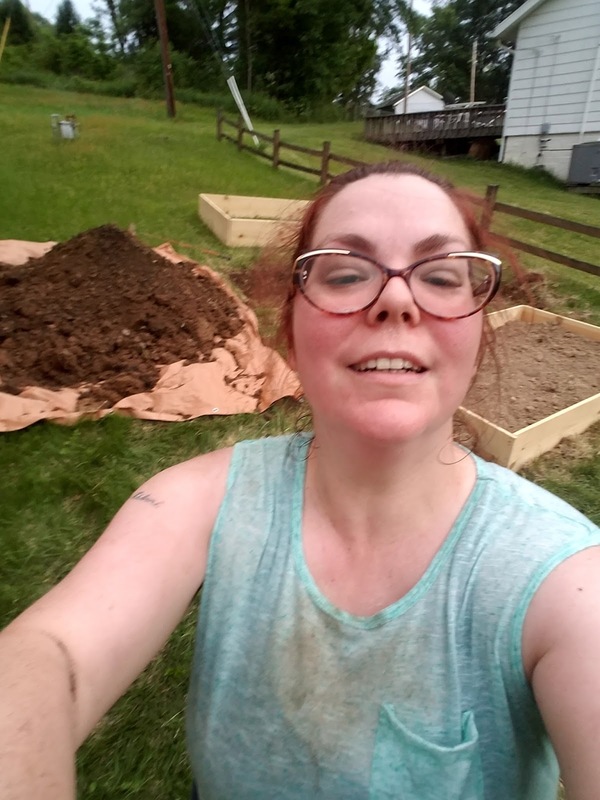 After choosing a sunny spot in the side yard, I spent three evenings digging two six-foot-by-four-foot holes in the side of the hill, installing the bed frames, and then refilling them with the dirt I’d just dug up. I’d tried purchasing dirt in bulk, but none of the local landscaping companies had any to spare that week. You know you’re an adult when you find yourself spending a weekday afternoon calling landscaping companies in an attempt to buy a truckload of live dirt. Bulk dirt is sold on a first-come, first-served basis, apparently, and I wasn’t about to be standing around in front of a landscaping supply store at 7:00 a.m. waiting for them to open up so I could put down a deposit on some sweet, sweet soil. It’s just as well, since I needed to terrace the beds anyway. At one point, I caught my hostile neighbor gawking at me from his car while I sweatily shoveled dirt like I was tied for first place in a dirt shoveling contest. I don’t know what he was thinking, but I really, really hoped he was thinking I was burying a dead body, because I want him to be afraid of me. Maybe if he’s afraid of me, he’ll tone down the hostility. 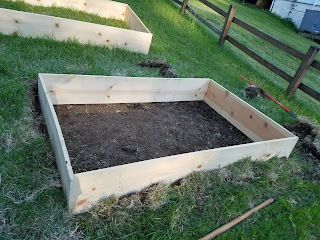 Once I finished installing the beds, I topped them off with what my friend Lydia referred to as “healthy dirt” from Lowe’s, although I have to admit that I’m skeptical about the nutritional profile of corporate-sourced dirt. Then I planted corn, cucumbers, lettuce, tomatoes, carrots, peas, beans, shallots, and Mexican gherkins. I erected rabbit-proof fencing around the whole thing and coated it all generously in Liquid Fence Deer and Rabbit Repellent. I used the powdered kind. I have some bad news, some worse news, some kind-of good news, and some best news. The worse news is that the lettuce, shallots, beans, and half of the carrots didn’t even bother to come up. Beans, lettuce, shallots, and 50 percent of carrots are terminally lazy. I know that’s a controversial position, but I have anecdotal evidence – which is, as we all know, the best kind of evidence – to support it. The bad news is that corn began growing, but stopped at about a foot tall and produced one measly, deformed ear before it all died for no apparent reason. I got three pods of peas before the heat killed them, but I knew that it was too late in the year to plant peas so that’s my own fault, really. I got three cucumbers before they, too, died for no apparent reason. 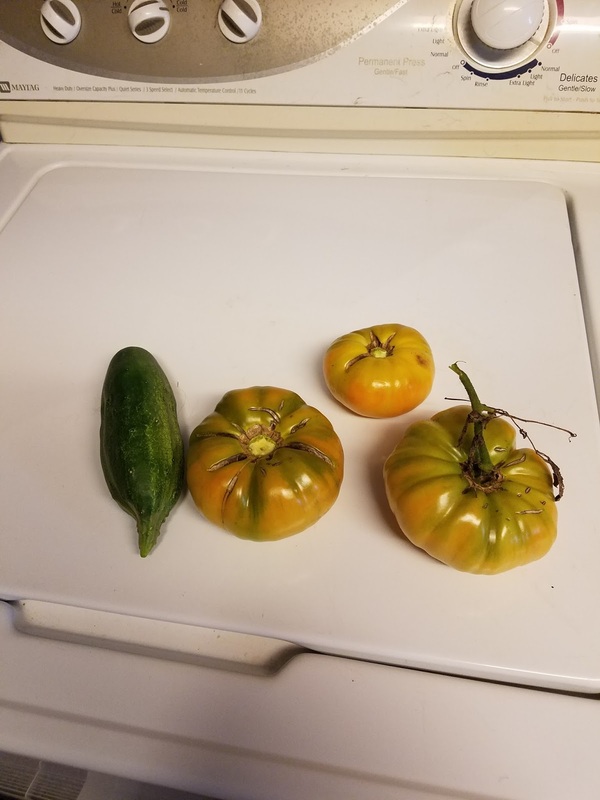 I got several tomatoes, but I planted an heirloom variety called Dr. Wyche’s yellow, and they were weirder than I expected, so I probably won’t grow them again. Also, the plants spent all summer looking like they were about to die any minute. I’m surprised I got any tomatoes at all, but the plants are still out there, gamely clinging to life, even though it’s October. 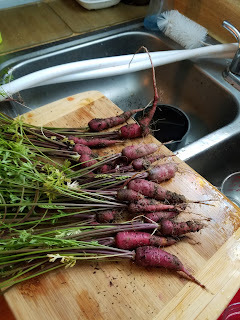 The kind-of good news is that the other half of the carrots did grow and I was able to harvest about a dozen of the saddest-looking carrots in the world. I generously presented them to my in-laws, who said, "Are you sure these are carrots?" There are still carrots in the ground as we speak, and I understand they’re cold-hardy, so the ones that are left might yet amount to something, like a stew. That leaves just one vegetable – the Mexican gherkins. You know how sometimes you’ll plant a vegetable garden and one thing will really go crazy? The best news is that Mexican gherkins have turned out to be really easy to grow. Seriously, if you, like me, are an apathetic, inexperienced, and unskilled gardener, plant yourself some Mexican gherkins, keep the rabbits out of them, and before you know it, you’ll have actual handfuls of weird little cucumbers that you don’t know what to do with. I like them, but I fed one to the manfriend and he made the kind of face my grandmother used to make when my grandfather implemented his pest control scheme. The best part about the Mexican gherkins is that I didn’t even think they would grow to begin with. I had a few seeds left from my abortive gardening attempt a few years ago, so I decided to plant them. They didn’t come up at first, and I thought they were just old, but then, after three whole weeks, tiny, tiny seedlings emerged…and stayed tiny for the next three months. Oh well, I thought, they’re not going to do anything. Then, one day round about mid-August, I went out to check on my few sad tomatoes, and noticed these huge vines with little watermelon-looking things all over them. I was so shocked I had to google them to make sure it wasn’t some toxic weed that had taken over my garden like neo-Nazis at a Republican convention. 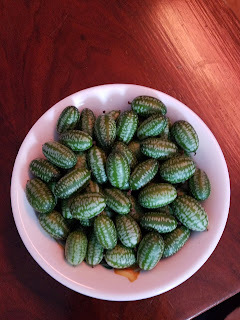 When the Internet told me that what I’d found were, indeed, Mexican gherkins, and that they would continue to produce right up until the first frost, I immediately resolved to plant Mexican gherkins again next year. You don’t mess with a good thing. 1. This was my grandfather’s horrifying means of keeping pests out of the garden. What can I say, it worked.